Inspiration can strike at any time. For brewers, time is often spent talking about different herbs, beer styles, flavors, or brewing methods with an expectation of the final product. Other times, it’s a creative force built on brewing experience that drives new beers that launch into the stratosphere. Truthfully, many ‘inspirations’ live out their days humbly in the taproom to be enjoyed by only a few. In any case, the road planned isn’t always the road traveled, which definitely applies to our newest canned brew, Anchor Meyer Lemon Lager™. In May of this year, we worked with our partner World of Beer to participate in their summer exclusive beer program. Select breweries around the U.S. each brewed a special beer to be tapped at all 65+ World of Beer locations across the country for one month. Our Kolsch-style ale with Meyer Lemon, California Uncommon, began pouring from WOB taps in June. California Uncommon was meant to be a “one and done” project – and it was. But… a funny thing happened along the way. 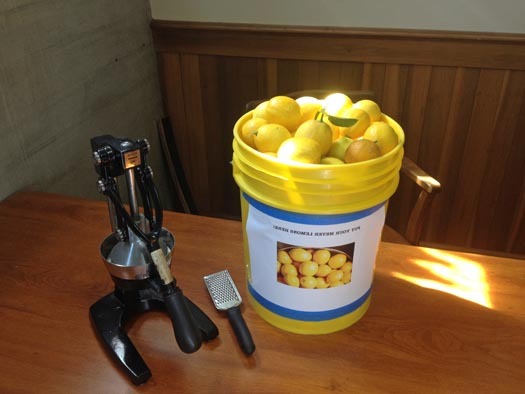 During our testing of different beer styles, fruit additions, and special ingredients, the test batches that included Meyer Lemons seemed to resonate with the brewers and internal team in a very positive way. Meyer Lemons in the Anchor brewhouse. This offering is quite different from our traditional and historical Anchor California Lager. Meyer Lemon Lager uses two different malts; pale two-row and Pils. In the whirlpool we use California cluster hops, then dry hop the beer with Nugget, Steiner, and Experimental No. 07270 hops. Our special ingredient is the California-grown Meyer Lemons, which are a cross between a true lemon and an orange, adding a sweeter, less acidic flavor than traditional lemons. The beer comes in at 4.5% ABV, and will be available in cans and on draught only in California for 2015, with plans to extend distribution nationwide in 2016. Our can design is inspired by a seventy-five-year-old fruit crate label from the Anchor Collection. We used the Ventura Maid trademark courtesy of the Ventura County Lemon Cooperative. Fruit crate labels have a long and colorful history in California dating to the late nineteenth century. Many examples of this type of agricultural art feature enticingly succulent fruit and an idealized pastoral landscape. 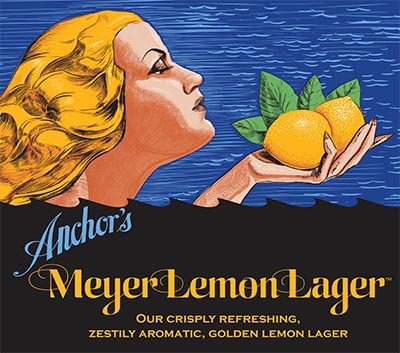 Ours, however, is as unique as the beer itself and features a Meyer lemon mermaid. If you live in California, or you’ll be visiting the Golden State soon, we hope you’ll have a chance to Raise Your Anchor with this unique and incredibly refreshing brew.